1. If you are using Google Chrome, you need to change your PDF reader settings. 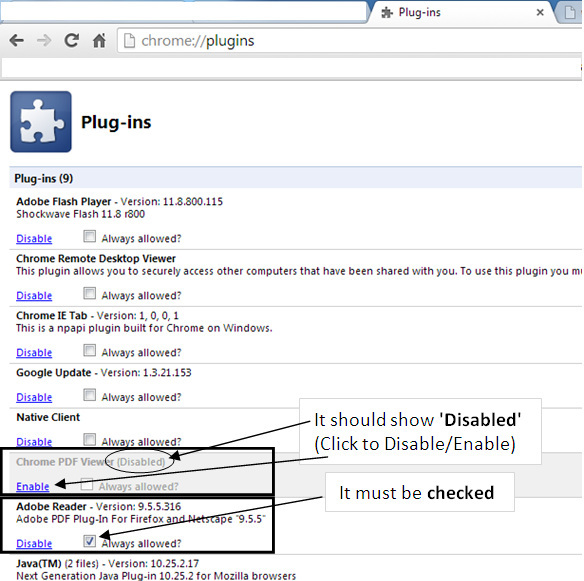 To do so, go to URL (or web address) chrome://plugins/ and make the settings as shown in boxes below. Also, please make sure that you have Adobe Acrobat Reader already installed. (please restart the browser after the changes are made). 2. The second solution, which requires no change to your browser, is to simply right click on the document (or chapter) link and do 'save link as' (as shown below). This way, you will be able to save the PDF file on your computer hard disk and then access it any time offline. 3. Third option is to use Internet Explorer, which to our knowledge is working fine with the www.guldustah.com website and causes no such issues. Copyright © 2013 Siddiqui Publications. For commercial use, All rights reserved.